Dryas is a genus of perennial cushion-forming evergreen dwarf shrubs in the family Rosaceae, native to the arctic and alpine regions of Europe, Asia and North America. The genus is named after the dryads, the tree nymphs of ancient Greek mythology. The classification of Dryas within the Rosaceae has been unclear. The genus was formerly placed in the subfamily Rosoideae, but is now placed in subfamily Dryadoideae. The species are superficially similar to Geum (with which they share the common name avens), Potentilla and Fragaria (strawberry). However, Dryas are distinct in having flowers with eight petals (rarely seven or up to ten), instead of the five petals found in most other genera in the Rosaceae. The flowers are erect and white with a yellow centre (Dryas integrifolia, Dryas octopetala) or pendulous and all-yellow (Dryas drummondii), and held conspicuously above the small plants. This makes them very popular in rockeries and alpine gardens. The hybrid Dryas × suendermannii, with cream coloured flowers, has gained the Royal Horticultural Society’s Award of Garden Merit. Dryas tolerates a wide variety of unshaded habitats, including alpine situations with sand or gravel substrate, similar substrates in flat tundra lowlands, and also fen habitats upon organic substrate where some shading from adjacent sedges or shrubs may occur. The Younger Dryas and Older Dryas stadials are geological periods of cold temperature that are named after Dryas octopetala, which flourished during that time and is used as a fossil indicator of those periods. Some Dryas plants have root nodules that host the nitrogen-fixing bacterium Frankia. Dryas drummondii forms root nodules and fixes nitrogen with Frankia. Dryas integrifolia does not form root nodules or fix nitrogen with Frankia. Dryas octopetala does not form root nodules or fix nitrogen with Frankia. Dryas × suendermannii (D. drummondii × D. octopetala) does not form root nodules or fix nitrogen with Frankia. ^ Morgan DR, Soltis DE, Robertson KR (1994). "Systematic and evolutionary implications of rbcL sequence variation in Rosaceae". Am J Bot. 81 (7): 890–903. doi:10.2307/2445770. JSTOR 2445770. .
^ Potter D, Eriksson T, Evans RC, Oh S, Smedmark JEE, Morgan DR, Kerr M, Robertson KR, Arsenault M, Dickinson TA, Campbell CS (2007). "Phylogeny and classification of Rosaceae". Plant Systematics and Evolution. 266 (1–2): 5–43. doi:10.1007/s00606-007-0539-9. .
^ "AGM Plants - Ornamental" (PDF). Royal Horticultural Society. July 2017. p. 33. Retrieved 24 January 2018. ^ Skrede I, Eidesen PB, Piñeiro Portela R, Brochmann C (2006). "Refugia, differentiation and postglacial migration in arctic-alpine Eurasia, exemplified by the mountain avens (Dryas octopetala L.)". Molecular Ecology. 15 (7): 1827–1840. doi:10.1111/j.1365-294X.2006.02908.x. PMID 16689901. ^ Swensen SM, Mullin BC (1997). "The impact of molecular systematics on hypotheses for the evolution of root nodule symbioses and implications for expanding symbioses to new host plant genera". Plant and Soil. 194 (1/2): 185–192. doi:10.1023/A:1004240004063. JSTOR 42948119. .
^ Becking JH (1984). Identification of the endophypte of Dryas and Rubus (Rosaceae). Plant and Soil. 78. pp. 105–128. doi:10.1007/978-94-009-6158-6_11. ISBN 978-94-009-6160-9. JSTOR 42934565. ^ Kohls SJ, Baker DD, van Kessel C, Dawson JO (2004). "An assessment of soil enrichment by actinorhizal N2 fixation using δ15N values in a chronosequence of deglaciation at Glacier Bay, Alaska". Plant and Soil. 254 (1): 11–17. doi:10.1023/A:1024950913234. ^ a b Kohls SJ, van Kessel C, Baker DD, Grigal DF, Lawrence DB (1994). "Assessment of N2 fixation and N cycling by Dryas along a chronosequence within the forelands of the Athabasca Glacier, Canada". Soil Biology and Biochemistry. 26 (5): 623–632. doi:10.1016/0038-0717(94)90251-8. ^ Deslippe JR, Egger KN (2006). "Molecular diversity of nifH genes from bacteria associated with high arctic dwarf shrubs". Microbial Ecology. 51 (4): 516–25. doi:10.1007/s00248-006-9070-8. PMID 16649061. ^ Markham JH (2009). "Does Dryas integrifolia fix nitrogen?". Botany. 87 (11): 1106–1109. doi:10.1139/B09-071. ^ (Reported as Dryas drummondii var. eglandulosa.) Kohls SJ, Thimmapuram J, Buschena CA, Paschke MW, Dawson JO (1994). "Nodulation patterns of actinorhizal plants in the family Rosaceae". Plant and Soil. 162 (2): 229–239. doi:10.1007/BF01347710. JSTOR 42939545. 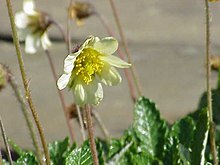 Wikimedia Commons has media related to Dryas (Rosaceae). This page was last edited on 29 January 2019, at 03:04 (UTC).